KAKTOVIK, Alaska — Come fall, polar bears are everywhere around this Arctic village, dozing on sand spits, roughhousing in the shallows and attracting hundreds of tourists who travel long distances to see them. At night, the bears steal into town. They leave only reluctantly, chased off by the polar bear patrol with firecracker shells and spotlights. On the surface, these bears might not seem like members of a species facing possible extinction. 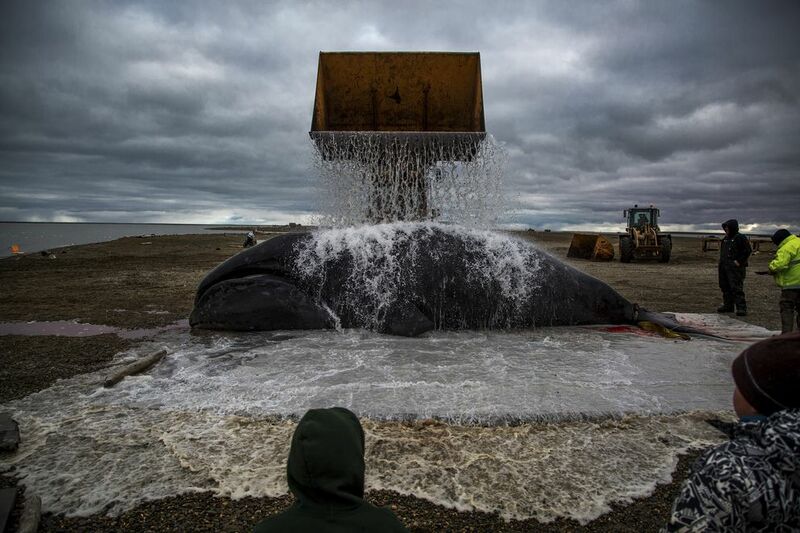 Scientists have counted up to 80 at a time in or near Kaktovik; many look healthy and plump, especially in early fall, when their presence overlaps with the Inupiat village's whaling season. But the bears that come to Kaktovik are climate refugees, on land because the sea ice they rely on for hunting seals is receding. The Arctic is warming twice as fast as the rest of the planet, and the ice cover is retreating at a pace that even the climate scientists who predicted the decline find startling. Much of 2016 was warmer than normal and the freeze-up came late. In November, the extent of Arctic sea ice was lower than ever recorded for that month. Though the average rate of ice growth was faster than normal for the month, over five days in mid-November the ice cover lost more than 19,000 square miles, a decline that the National Snow and Ice Data Center in Colorado called "almost unprecedented" for that time of year. In the southern Beaufort Sea, where Kaktovik's 260 residents occupy 1 square mile on the northeast corner of Barter Island, sea ice loss has been especially precipitous. The continuing loss of sea ice does not bode well for polar bears, whose existence depends on an ice cover that is rapidly thinning and melting as the climate warms. The largest of the bear subspecies and a powerful apex predator, the polar bear has become the poster animal for climate change. Even as the polar bear's symbolic role has raised awareness, some scientists say it has also oversimplified the bears' plight and unwittingly opened the door to attacks by climate denialists. "When you're using it as a marketing tool and to bring in donations, there can be a tendency to lose the nuance in the message," said Todd Atwood, a research wildlife biologist at the U.S. Geological Survey's Alaska Science Center. Few scientists dispute that in the long run — barring action by countries to curb global greenhouse gas emissions — polar bears are in trouble, and experts have predicted the number will decrease with continued sea ice loss. A 2015 assessment for the International Union for Conservation of Nature's Red List projected a reduction of more than 30 percent in the number of polar bears by 2050, while noting there was uncertainty about how extensive or rapid the decline of the bears — or the ice — would be. But the effect of climate change in the shorter term is less clear-cut and a populationwide decline is not yet apparent. Nineteen subpopulations of polar bears inhabit five countries that ring the Arctic Circle — Canada, the United States, Norway, Greenland and Russia. Of those, three populations, including the polar bears in the southern Beaufort Sea, are falling in number. But six other populations are stable. One is increasing. And scientists have so little information about the remaining nine that they are unable to gauge their numbers or their health. The researchers who conducted the Red List assessment concluded that polar bears should remain listed as "vulnerable," rather than be moved up to a more endangered category. Even a few decades ago, most polar bears in the southern Beaufort Sea remained on the ice year-round or, if they did come to shore, stopped only briefly. The sea ice gave them ready access to seals, the staple of their high-fat diet. But as the climate has warmed, the spring thaw has come earlier and the fall freeze later. The pack ice that was once visible from Kaktovik even in summertime has retreated hundreds of miles offshore. As a result, researchers have found, a larger proportion of the bears in the southern Beaufort region are choosing to spend time on shore: an average of 20 percent compared with 6 percent two decades earlier, according to a recently published study by Atwood of the Geological Survey and his colleagues that tracked female bears with radio collars. And the bears are staying on land longer — this year they arrived in August and stayed into November. "It's one of two choices: Stay with the pack ice or come to shore," Atwood said of the southern Beaufort bears. "If they sit on that ice and those waters are very deep, it will be harder for them to find nutrition." The proliferation of polar bears in Kaktovik in the fall has drawn wildlife photographers, journalists and climate-change tourists to the village, filling its two small hotels or flying in from Fairbanks for the day on chartered planes. About 1,200 people came to view the bears in 2015, and the number is increasing year by year, said Robert Thompson, an Inupiat guide. The increasing tourism has been a financial boon for some people in Kaktovik but it has upset others. Tourists take up seats on the small commercial flights in and out of the village during the fall months when the bears are there, crowding out residents who need to fly to Anchorage or Fairbanks. Some visitors wander through town snapping pictures without asking permission. But as the Arctic ice continues to shrink, bears are arriving in poorer condition and are staying longer. Interaction between bears and humans is becoming more common, exposing the polar bears to more stress and the people to more danger. The biggest threat to the polar bear is something no regulatory authority involved in wildlife conservation can address: the unregulated release of carbon dioxide and other greenhouse gases into the atmosphere. For many researchers, the most pressing question is how many days a polar bear can survive on land without the steady source of high-fat nutrition that seals usually provide. Some scientists have suggested the bears might learn to survive on other types of food — snow geese, for example — or that they might learn to catch seals in the water, without relying on the ice as a platform. But most researchers say that is unlikely. Such changes usually evolve over thousands of years, said David Douglas, a research wildlife biologist at the Geological Survey. 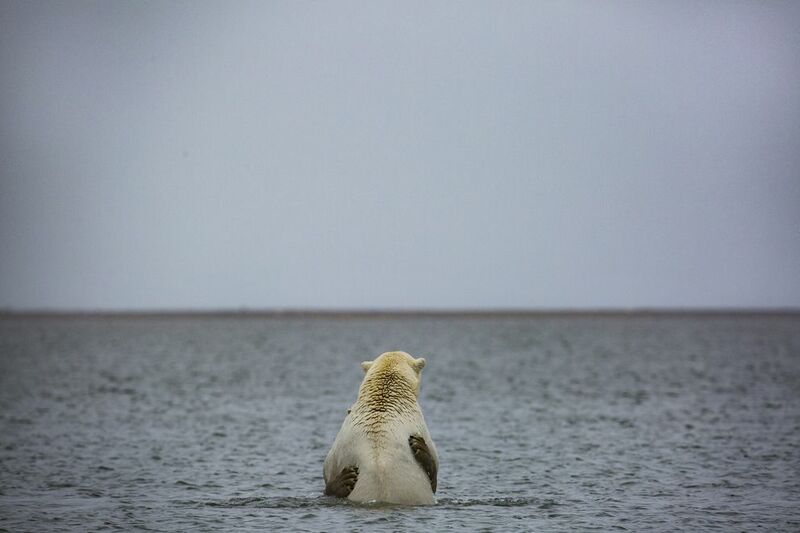 But the loss of sea ice "is taking place over potentially a very rapid time frame, where there may not be a lot of time in polar bear generations to home in on behaviors that could give some advantage," he said. Much depends on how much of the ice disappears. Under some climate models, if steps are taken to control greenhouse gas emissions, the species could recover. In Kaktovik, at least for now, whales are providing bears with an alternative source of food. But "the bears are not here because we hunt whales," said Thompson. "They're here because their habitat has gone away and it's several hundred miles of open water out there."